So I was recently contacted by the Hut Group and kindly sent a bundle of goodies to try out and share with you guys. I was asked on my preferences on colours, hair and skin types etc but the products were left as a complete surprise. Here is what I got! First is the Goldwell Dualsenses Rich Repair 6 Effects Serum (100ml for £12)*. This is a product that's perfect for damaged hair and split ends, which when you have hair as long as mine is generally a bit inevitable. This product is going to help smooth out any frizzy bits, give a nice shine and generally nourish and help repair my ends. A great choice and 100% something that is going to be useful for me. Next up is something that I already know and absolutely love, it's been much hyped about but I believe rightly so. It's the Benefit They're Real! Mascara (full size is £19.50)*. I have tried this mascara before and quickly elevated it to my top 5 of all time mascaras (which I will do a seperate post on at a later date!!). The thing I love the most is the brush, as you can see below it's going to be perfect for coating the smaller lashes in the harder to reach parts and the bristles glide straight through leaving no clumps but tonnes of volume. Another perfect choice! Then we have a product that just made me so excited to see in my package, a Nars Lipgloss* in Turkish Delight. I am such a fan of Nars eyeshadow products but have never tried any of their lipglosses so this was such a good chance for me to test one out finally. I can report that Turkish Delight is the prettiest light pastel pink with just the right amount of pigmentation and it's non sticky and long wearing. I would say this lipgloss looks nice on it's own or layered over a lipstick to give a really nice glossy look. The last product is the Natural Flush Blusher by EX1 (3g for £7.99)*. Firstly I am loving the rose gold packaging, I feel it adds a really luxe look. The blusher itself is a nice light formulation with good pigmentation/colour payoff and it adds a nice subtle glow to your cheeks and looks nice and natural. I have to say, I am really impressed with the selection of products, each and every one is something I would definitely use/purchase and it introduced me to EX1 and Goldwell who I will be looking at more closely in the future. Now I have shared all the treats that I received, how about I now share what you guys have the chance to win?! The Hut Group have so amazingly agreed to sponsor 1 set of Jo Hansford Expert Colour Care Every Day Shampoo and Conditioner with a mini Illuminoil (worth £46) from www.hqhair.com to celebrate reaching 100,000 views and 1,500 Bloglovin followers which are both amazing achievements for me. 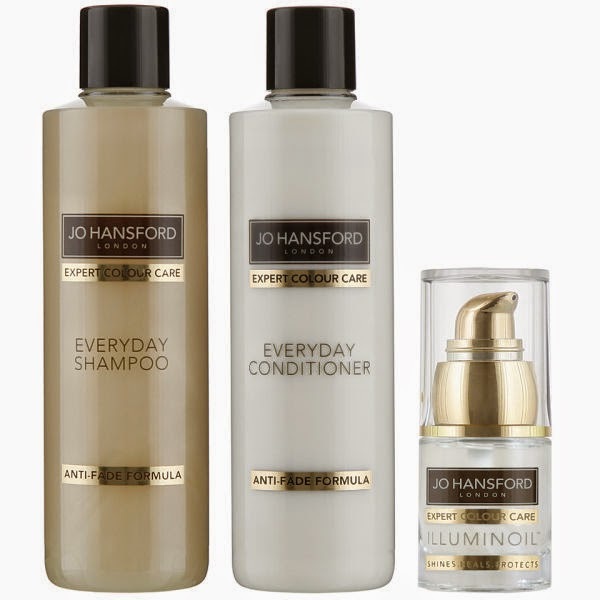 You can view the rest of the Jo Hansford range here: http://www.hqhair.com/health-beauty/brands/jo-hansford.list. To enter all you need to do is fill in the Rafflecopter below. We are shipping to the UK only and the giveaway ends on 31st August. Good luck and thanks so much for reading! 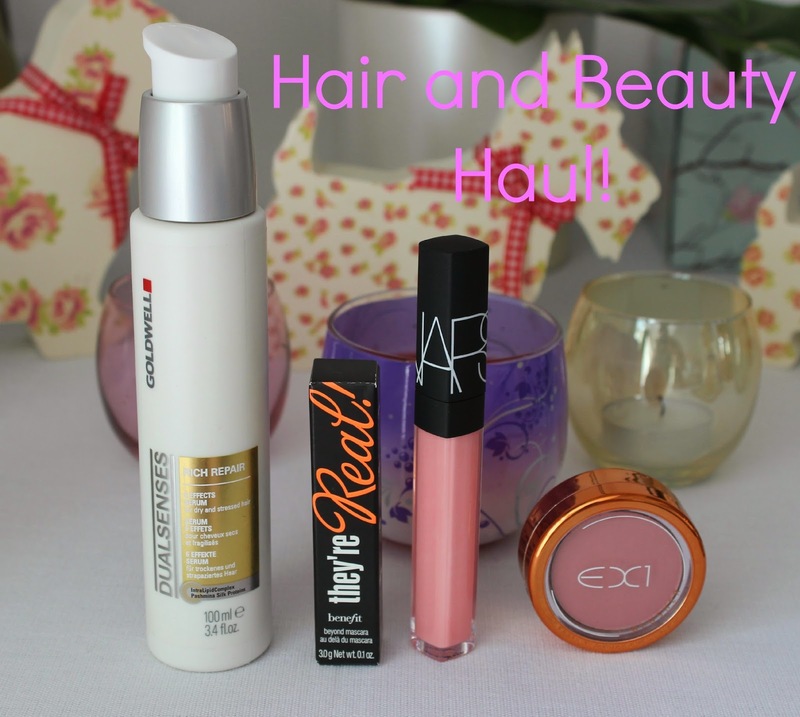 Some lovely products here! The Nars Lipgloss looks lovely! A lovely selection of products, always wanted to try aromatherapy associates so would get one of their oils! Sebastian Shaper Zero Gravity is the best! Has to be the Kerastase range - fab! GHDs and morrocanoil hair treatment!